The showdown between Israel’s Supreme Court and the parents of students at a haredi Orthodox school found guilty of discriminatory practices against Sephardic girls has brought already strained secular-religious relations in Israel to a fever pitch. A remark by Supreme Court Justice Edmond Levy that the court’s decisions are not subject to rabbinical approval went straight to the heart of the matter, with irate haredi demonstrators declaring that if they had to choose between the court and their rabbis, the rabbis always would come first. The fundamental argument over whether the courts or the rabbis have the ultimate authority reflects a long-standing clash between Theodor Herzl’s vision of a secular democratic state for the Jews and haredi notions of a Jewish state subject to rabbinical law. For secular Israelis, impugning the authority of the courts means anarchy. For the haredim, overriding rabbinical rulings means perverting God’s will. At issue is a test of the capacity of the Zionist, secular state to impose its will on a large group of haredim who often are derisive of its democratic, secular institutions. The latest angry confrontation between the state and the haredim began with a ruling by the Israeli Supreme Court in April ordering a school run by Ashkenazi Slonim chasidim in the west bank settlement of Emanuel to stop excluding Sephardic girls from their regular classes. In the state’s view, the practice constituted a form of intolerable segregation and violated basic principles of equality and human dignity. 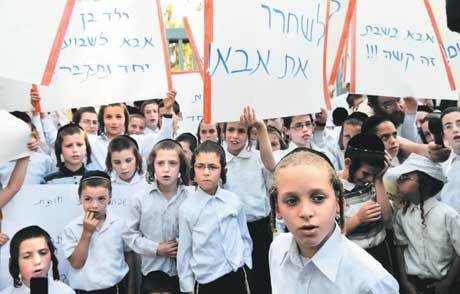 The offending Beit Yaakov school agreed to more mixed classes. But rather than comply, the Ashkenazi parents started their own school next door. They argued that the segregation wasn’t ethnic but religious. The Sephardic girls, they said, came from homes less strictly observant than their Ashkenazi daughters – for example, homes with television sets and Internet connections – and they didn’t want their daughters influenced by those who were less religious. They said Sephardic girls were welcome at the Ashkenazi-dominated school if they met the standards for stricter religious observance. The court ordered the parents to send their children back to Beit Yaakov or face fines. The parents ignored the court order and didn’t pay the fines. The court found them guilty of contempt and ordered that they be sent to jail for an initial two-week period to reconsider their position. Amid defiant singing and dancing, 35 of the 38 fathers went to jail last week. The mothers failed to report for their prison terms on the grounds that they needed to be home to look after their younger children. There are conflicting accounts over what caused the brouhaha and what it means. The Slonim chasidim say that in a true democracy, they should have the right to educate their children in any way they please. They say the Israeli state, like the Romans and Greeks before them, is interfering in matters of religious principle. Just like their ancestors, they say, they’d rather face punishment than compromise their religious beliefs. In the chasidic account, the parents’ going to jail was presented as a form of martyrdom, showing up the inhumanity, lack of values, and wanton persecution of the haredi Orthodox by the secular Israeli state. Secular Israelis see things quite differently. Many regard the Emanuel school case as a reflection of a much wider phenomenon, that of the haredim milking the state for funds without accepting its authority or performing the ultimate duty of Israeli citizenship: army service. Haredi schools are largely state-funded but do not teach the country’s core curriculum. The secular press in Israel has been inundated with articles blasting the haredim for defying the state’s authority while tapping into its budgets for health, education, and welfare. Nowhere else in the world would haredi Jews have the temerity to behave this way, the secularists say; nowhere else would they defy state law or mock the Supreme Court. Many see the standoff as a test of strength the liberal democratic state cannot afford to lose. “Don’t give in to Emanuel,” the liberal daily Haaretz exhorted in an editorial. “We must not surrender,” echoed journalist Yair Lapid, who reportedly is on the brink of launching an anti-clerical successor party to Shinui, the party once led by his late father, Yosef “Tommy” Lapid. The Orthodox-Sephardic Shas Party was more ambivalent. Shas was created in the mid-1980s to combat Ashkenazi discrimination against Sephardim, so it might have been expected to take up the cause of the Sephardic students and families. But to do so would have seemed like siding with the Supreme Court, which is anathema for Shas. Its spiritual leader, Rabbi Ovadiah Yosef, resolved the dilemma by coming out against discrimination, but more strongly against taking the case to the Supreme Court. “Anyone who appeals to the secular courts will have no share in the world to come,” Yosef declared. Other recent rulings by the Supreme Court have compounded the strains between the haredim and the state, as well as a string of violent clashes between haredi demonstrators and police. In mid-June, the Supreme Court ruled against state stipends for married yeshiva students on the grounds that similar stipends for married university students were abolished in 2000. A seven-member panel ruled that this constituted a violation of the principle of equality in the distribution of public funds. Either all married students should get the stipend or none, the court ruled. Shas leader Eli Yishai has vowed to introduce legislation to overrule the Supreme Court decision. 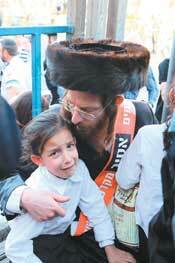 The ruling was seen as a major blow to the haredim, many of whom choose to study Torah rather than work for a living. This exempts them from mandatory army service. The haredim also clashed recently with police during demonstrations against building on sites where ancient bones are believed to be buried. These often violent protests were led by a small radical group in the haredi camp known as the Atra Kadisha. In May there were clashes over the removal of bones – believed to be pagan – from the site of a new rocket-proof emergency room at Barzilai Hospital in Ashkelon; in June there were protests in Jaffa over bones at the construction site of a boutique hotel. For its part, the Israel Defense Forces is considering launching a new plan that would allow more yeshiva students to enlist and more yet to join the labor force. At present, yeshiva students must remain in school until middle age in order to stay out of the army. Meanwhile, with the basis of Prime Minister Benjamin Netanyahu’s government a strategic alliance between Likud and Shas, government ministers have had very little to say on the Emanuel school brouhaha for fear of upsetting their haredi coalition partners. But it also means that Shas is unlikely to do anything that could topple the government. If tensions remain high, it could strengthen secular parties in the Knesset willing to take a stand against the haredim. That’s what happened in 2003, when Shinui won 15 seats. But three years later it lost the seats when members defected to other parties. Whether the current haredi-secular tensions will translate into a political shift, and whether that could be sustained, remains to be seen.